You know the feeling of getting your necklaces tangled with another necklace or bracelet. What better way to organize your jewelries with a perk of a full length mirror embedded? LANGRIA's free standing cabinet styled jewelry armoire offers you a great storage solution while keeping your everyday get-ready time fast and easy. 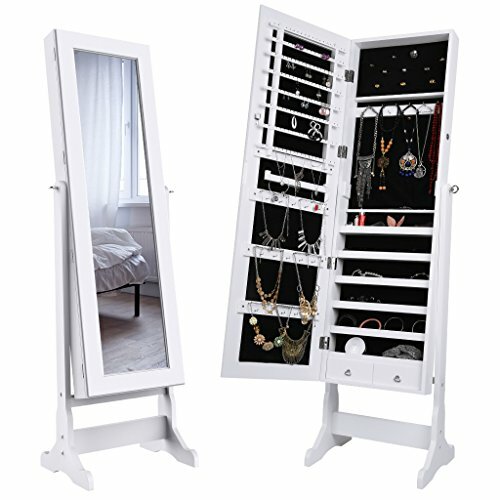 You know you want to look good before you leave the door and that's why LANGRIA's mirrored jewelry armoire features a full-length vanity mirror, making it super convenient to change up your outfit or doing your makeup. Featuring 3 adjustable angles by changing the wood sticks in the back, you are able to use it in any angle you like. Being lockable with keys, LANGRIA's jewelry armoire keeps your jewelries, makeups and other accessories safely locked away from dust and prevents from going flying open. Moreover, the protective black fabric inner lining and 2 drawers prevents your jewelries from being scuffed, scratched and dirty, while the lock system can keep your accessories such as rings, earrings, necklaces, bracelets and more in a safe place when you're away.